Today I'm sharing a single page layout I created for our Grandson Greyson aka our "Grand Prince". This is our only grandchild and he is 9 months old and lives in Whitehorse, YK. Sooooo far away from Ontario so I have to busy myself creating layouts of him so I can look at his precious little face all the time. The day these shots were take it was a balmy -5 warm for someone who lives in the Yukon lol. Greyson loves the snow and would be more than willing to just hang out and play but he was just out for a quick little bit of fresh air. I LOVE his handmade bunny slippers so if you were wondering why I made the "Bunny" die cut this layout is why. At first I thought it kind of weird to create a winter layout with a bunny but now that I have it all put together I'm rather pleased with the outcome. Hope you like it too. Products used: Photo Play Winter Meadow patterned paper "Winter Joy", "Winter Wishes" & "Winter Woods", cardstock "Lagoon" & "Juneberry", OCS Custom Die Cut "Snow Much Fun" & "Baby Bunny"
Thanks for stopping by today, hope to see you again soon! I created this single page 12 x 12 layout for my Grandson, I'm just waiting for the pictures to be sent to me. I was under a bit of a time crunch when I was making this layout so I went for a single instead of my traditional double page. Well I have been on a mission to complete this layout in time to join the OCS Design Team for the November 2014 Challenge.....I completed my mission!!! The November Challenge which goes live on Nov. 1st is "Anything Goes". 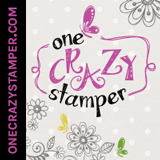 We hope you can join all the fun on the DT Blog for your chance to win a Stamp Prize Pack. You can find the Blog HERE. I had mentioned before I was all done with Halloween layouts for now and I'm moving on, but before I can get to Winter layouts I must complete some Fall layouts. My children were away for the Thanksgiving weekend and they sent me some beautiful pictures, which will go in the 2 spots on this layout. Sorry my son won't send me pic's if I post them online...so they are blank for now. We might sneak one in on an upcoming layout...shhh!! I really enjoy working with the Fall colours so for this layout I chose the new Simple Stories Sweater Weather collection. My stamps for this layout are Guard Duty Rudy, Hay Bales & Harvest Mice all from High Hopes Rubber Stamps. I hope you enjoy today's post & you will come to submit your project for the OCS November Challenge! Just Hanging Out Halloween Fun! Today I have one more Halloween layout for you before I move on to some Fall & Winter stuff. I have so many years to catch up on in my scrapbooks for 2 kids that I could continue on...but that will have to wait. All the images are coloured with Copic as listed below each pic below. Thanks for stopping by today & I hope you enjoy the layout. I have another completed Not So Spooky Halloween layout to share with you today. I wanted to use up the scraps of paper I had left from the layout I previously posted so this layout was the result. I added a little purple to this and coloured my images to match. This was a quick and fun little layout that took no time at all. I love to colour my stamps for my layouts and since I love to colour so much I get the best of both worlds...colouring and scrapping all in one! This layout features a couple new releases from High Hopes Rubber Stamps and new papers from Carta Bella & MME. Check out the product list below for all the supplies I used. Busting a groove on Baby Boy Layouts!! Okay I'm thrilled that I have another set of layouts done for my sons scrapbook. Okay who said the fact that he is 24 years old now means I'm a wee bit behind in my scrapbooking? It's never too late right! Rarely do I ever do anything without stamping and colouring but this is one of those times. I have the perfect pictures set aside to go into these layouts of my son with his Nana on the day he was born. Can't wait to attach them! This layout uses the new Pebbles Collection Special Delivery Boy just in case you are looking to scrap lift please feel free...you can find all the stuff HERE at the OCS store. Finally I'm back to post my 3rd layout in my Woodland Winter series. For this one I went for the blue and white theme. I have kept it quite simple but I like how it turned out. The Maya Road snowflakes were covered with Inka Gold and then glittered up. Hope this layout brings you some winter inspiration. I mentioned the other day that I was working on a little series of Winter layouts to get ahead of the game this year. Well today I'm back with Layout Set #2. The images I have used on this layout are High Hopes - Snowy Tag & Snowy Portrait the verse Think Snow is also High Hopes. I coloured the images with Prisma Premier Pencils. The snowflakes are from Maya Road and they were raw chipboard which I covered with Turquoise Inka Gold to help them match the layout. Sorry we are out of stock on that colour at the moment but it will be back again real soon. I have also used the Martha Stewart Snowflake Border Punch and the Cottage Cutz Icicle Border again. I kind of have a theme going on for all of my Woodland Winter layouts I'm sure you will see the pattern as you see them all. The Icicle Borders are just tacked down with just a spot of glue so I can remove them to put my pictures on when they are ready. Sorry this picture didn't come out the best...gee I need help with photography for sure! Well I'm getting a jump start on my Winter layouts this year. We received the new Bo Bunny Woodland Winter Collection last week in the store and I had a flood of ideas come to mind, so getting started was easy. I'm also very excited to have our Niece coming to spend 11 glorious days with us over Christmas. This will be the first time she gets to see real "snow"! Our calendar is starting to fill up with things to do while she is here so I need to get plenty of layouts done prior to her arrival. My daughter is going to FREAK when we take her to the airport for our surprise guest...I can hardly keep the secret LOL! Materials: Bo Bunny Woodland Winter patterned paper - Peek-A-Boo, Woodland Winter, Winter Scarf, Memory Box Precious Snowflake 98729, Impression Obsession Dies Snowman DIE116R, Martha Stewart Snowflake Punch, Glitter, Cottage Cutz Icicle Border, Letters cut with electronic die cutter, High Hopes rubber stamp coloured with Copic "Snow S267"
Thanks for stopping by today...hope to see you soon!